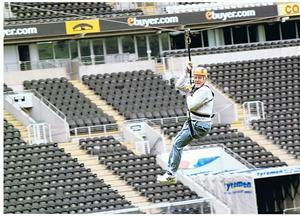 Peter Shipp, Chief Executive of EYMS, has raised money for charity by taking part in The Big Zip at the KC Stadium. The East Yorkshire Coaches sponsored event, which involves participants sliding down a 150 metre long zip wire from 26 metres up in the stadium stands, was to raise funds for Marie Curie Cancer Care. Mr Shipp, who has been in the bus industry since 1962, said before the event: "If I'm going to scare myself silly I don't want to do it for nothing". He wants to say a big thank you to all who sponsored him for helping to support this very worthwhile charity, as he raised almost £4000. Find out more about Marie Curie Cancer Care. 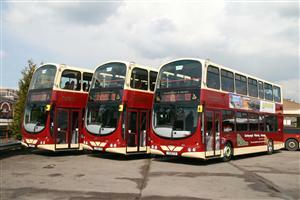 26 metres is the height of nearly 3 double decker buses stacked on top of each other!